When ice inserts freeze, small ice crystals form. Fully-frozen, the pack is fills with small ice crystals which look and feel like soft flakey snow, are malleable and conform to the horse's body. As the pack freezes and the ice crystals form, the pack expands slightly and needs to draw in air through the patented insert/bag vent. The vent is designed to resist liquid flow into or out of the insert. The conversion of the liquid to solid, which occurs during freezing the insert, is what extends the time the bags stay below freezing. The patented formula of polymer granules eliminates the burning sensation associated with raw ice. Ice inserts stay frozen for over two hours. After use the inserts can be re-frozen. After extensive use the inserts become chunky – this is how you know when it's time to replace them. 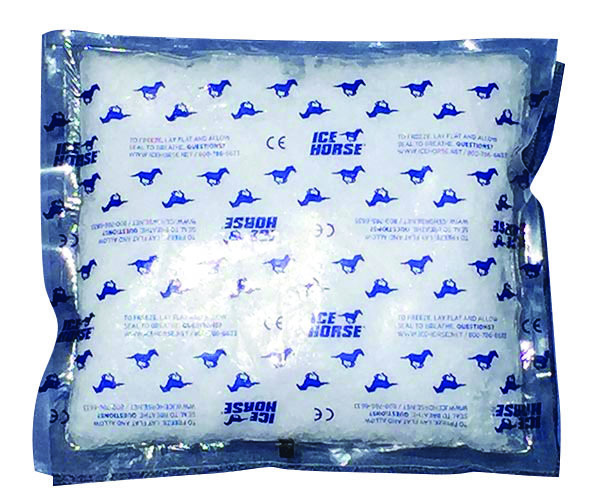 Reusable Ice Packs mold to the horses legs and provide continuous cold therapy for over two hours per application.